One of my group 24 series batteries has gone bad. I would like to replace them with 6-volt, golf cart batteries. I was at the PRVCA Show and attended your battery seminar and I thought you told us we would only need two, 6-volt deep cycle batteries. Can I do this? How many do I need and how do I hook them up? I have a HR Presidential 36'. Everyone I ask tells me I’ll need four, 6-volt batteries to replace the current 12-volt batteries. Richard, your two Group 24 batteries connected in parallel yields approximately 170 combined amps of storage (about 65-amps each). Two Trojan 6-volt batteries wired in series yields about 225 amps at 12-volts. The more batteries you add, obviously the more current you’ll be able to store. Four of the same 6-volt batteries wired in a series-parallel configuration, for example, will provide about 450 amp-hours of use. Even if you had two Group 27 batteries in parallel, they would total about 210 amps, still less than two 6-volt golf cart batteries. 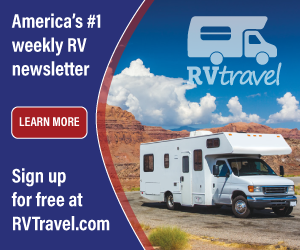 When wiring two 6-volt batteries in series, the hot lead (from the RV) connects to the positive post of one battery and the negative lead to the negative post of the second battery. 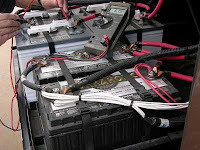 A jumper cable interconnects the two batteries between the negative post of the first battery and the positive post of the second battery. Connect the positive cable to the first battery first, then the interconnecting cable second and finally, the ground cable to the second battery last.